RESISTANCE and revolution are once more in the air in Greece as the global finance system tries to grind its people down to pay for the speculators' greed. 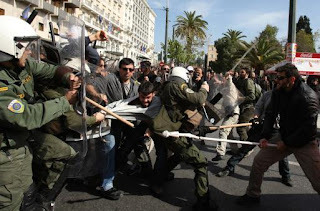 Reports today's SchNEWS direct action news bulletin: "Greece has once again been rocked by protests, strikes and civil unrest. This time in response to a series of swingeing government cutbacks aimed at bringing the country into line with neo-liberal dogma and reducing its budget deficit. "The measures proposed include a rise in the retirement age, slashing of state bonuses and controls to diminish tax evasion together with higher taxes on fuel, tobacco and alcohol. However, any austerity measures will have to be forced through in a country with a population already verging on open revolt. A shock doctrine approach isn’t going to catch the Greeks by surprise." The massive opposition is not stopping the global bloodsuckers from maintaining and even upping their demands, however. Reports today's Wall Street Journal: "The European Union is pushing Greece to urgently adopt new austerity measures amounting to an extra €4 billion ($5.42 billion) if it is to achieve its goal of slashing its staggering budget deficit by four percentage points this year, a senior government official said Friday. "'They [the EU] are telling us the current measures will only cut two percentage points. They are pushing very hard for another package of around €4 billion,' the official, who asked not to be identified. 'Greece thinks a package of €2 billion to €2.5 billion will be enough to achieve the targets,' he said. "Officials from the EU, the International Monetary Fund and the European Central Bank had been in Athens since the start of the week to evaluate Greece's progress in cutting its budget deficit—an issue that has hit the euro and financial markets across the world because of fears that Greece could become the first euro-zone country to default on its debt payments. " A SINISTER military conspiracy, probably covertly backed by the USA, is being confronted by the Turkish government. Reports the BBC: "Seven senior military officers have been formally charged in Turkey with attempting to overthrow the government. "They include four admirals, a general and two colonels, some of them retired. "The seven were among more than 40 officers arrested on Monday over an alleged 2003 plot to stir up chaos in Turkey and justify a military coup. " Says Al Jazeera: "The arrests are believed to be linked to a purported 2003 plot to discredit the AKP government, a plan revealed by the Taraf newspaper in January. "The plan, codenamed Sledgehammer, involved bombing two Istanbul mosques and escalating tensions with Greece by forcing Greek jets to down a Turkish plane over the Aegean Sea. "The act would have been an attempt to show the Turkish government as inept, according to documents obtained by Taraf." Adds the BBC: "The alleged plot is similar, and possibly linked, to the reported Ergenekon conspiracy, in which military figures and staunch secularists allegedly planned to foment unrest, leading to a coup. "Scores of people, including military officers, journalists and academics, are on trial in connection with that case." However, the BBC does not report on links with the Europe-wide Gladio conspiracy, in which a secret network of 'stay-behind' guerrillas/terrorists was set up by the USA and UK to ensure control of governments remained in 'friendly' hands. Explains Wikipedia: "As one of the nations that prompted the Truman Doctrine, Turkey is one of the first countries to participate in Operation Gladio and, some say, the only country where it has not been purged. "According to Italian magistrate Felice Casson, the Turkish stay-behind forces are two-pronged: the military "Counter-Guerrilla", and the civilian "Ergenekon". An offshoot of the latter organization is currently the subject of a major investigation. Casson says Turkey is home to the most powerful branch of Operation Gladio." MASKED radicals used the cover of carnival to attack a Benetton store in Spain. Reported Angry News from Around the World: "Seven masked people entered the shop right in the centre of Lugo, giving no possibility of identification to the CCTV cameras. "According to investigators, the group probably prepared the attack in advance, taking advantage of the carnival festivities in order not to attract attention. "They believe, moreover, that there is some anarchist organisation behind it. In fact, in the libertarian forums news of the attack was spread extremely rapidly, including details of what was written on the walls of the shop. "The damage to the inside of the shop was considerable. The authors of the incident broke the windows with clubs. The metal detector at the entrance was also damaged. "Inside clothing was thrown to the ground, some stained with red paint.Computers and coat hangers were also damaged. The employees were not attacked in any way. The attackers were only concerned with material damage. "The police have no doubt that it was a question of an attack in defence of the Mapuche community of South America that have been carrying on a struggle for a number of years against the controversial Italian brand." Explained a campaign website: "The Italian fashion brand Benetton is well known for its 'provocative' promotion campaigns that appear to be socially critical. "But the internationally operating company is itself involved in dirty deals. In south Argentina, Benetton has bought almost one million hectare of land. "The local population, mostly Mapuche indigenous people, are forcefully removed from this area. They are calling for solidarity and action against Benetton." THE LATEST US-led operation in Afghanistan descended into farce this week, with an air strike attacking the wrong side. Official propaganda has been making much of the fact that the USA and its allies have been fighting alongside Afghan forces in the latest phase of their occupation. But, having already killed half a dozen innocent locals in one battle, NATO launched a disastrous air strike that "mistakenly killed seven Afghan police and wounded two others on Thursday", according to reports. 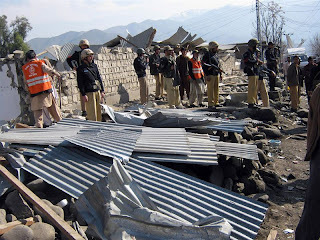 Said AFP: "The incident occurred when a joint patrol by the Afghan army and police and NATO forces came under Taliban attack in the Imam Sahib district, Afghan interior ministry spokesman Zemarai Bashary told AFP." Meanwhile, a group of about two dozen Afghan national police officers may have defected to the Taliban, according to American and Afghan officers in Wardak Province. 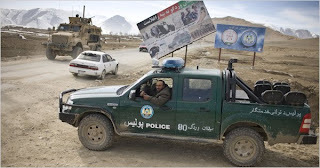 Reported the New York Times: "The police officers left their posts in Chak, a remote district of Wardak, just before midnight Wednesday, and on Thursday morning a spokesman for the Taliban claimed that the officers had surrendered to them. 'They left with all their weapons, two trucks and machine guns and heavy weapons,' said Maj. Abdul Khalil, the police chief in the Jalrez district, just north of Chak." GREEK resistance fighters have hit back at the global bankers plunging their people into poverty. 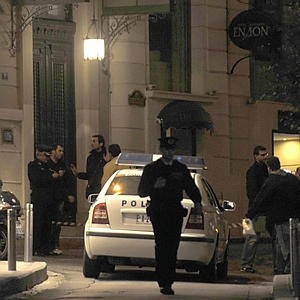 A bomb exploded outside a JPMorgan Chase office in Athens on Tuesday - thanks to the usual warning, nobody was hurt. Reported the New York Post, in a report headed 'Blast proves Greeks miffed': "The blast comes just days after reports that JPMorgan, Goldman Sachs and other banks may have played a role in creating the current sovereign debt crisis looming over a number of European countries by selling to those nations products which helped them spend beyond their means. "A JPMorgan spokesman declined to comment on the bank's sovereign financing business. Goldman officials also declined to comment. "While no one has yet claimed responsibility for the blast, the explosion happened against a backdrop of increased frustration across Greece amid signs that the Greek government will be slashing costs in an effort to avoid a financial collapse. "Indeed, the European Union yesterday said it would consider providing substantive aid to the struggling country only if it first took steps to help itself, including balancing its budget, slashing spending and imposing new taxes. The country has until March 16 to come up with a plan. "The anticipated belt tightening by the government doesn't sit well with Greek citizens, many of whom have taken to the streets in recent days to protest. "Greece's national deficit has ballooned to 120 percent of gross domestic product -- the highest among the countries in the European Union, according to data from Bloomberg. Perhaps even more troubling, Greece has $11 billion in debt that will need to be refinanced in April and May, said Larry Kantor, head of research at Barclays Capital. "Earlier in the week, Greek Finance Minister George Papaconstantinou suggested in published reports that Greece may be just the tip of the iceberg. 'Today it is Greece, tomorrow it can be another country,' he warned. "Indeed, many observers say bigger countries such as Spain could pose an even bigger threat to global financial stability than Greece." 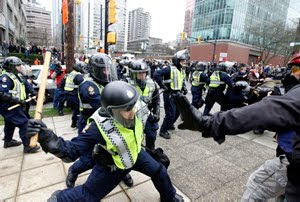 ANARCHISTS clashed with police in Vancouver, Canada, over the weekend in a high-profile protest at the corporate junket known as the Winter Olympics. Reported the LA Times: "Anti-Olympic protests erupted into clashes with police Saturday as a roaming band of masked activists broke plate-glass shop windows at the iconic Hudson's Bay Co., smashed car windows and hurled trash cans and news racks into busy intersections. 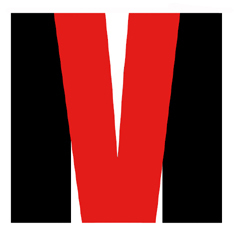 "Riot police moved in several times to secure key downtown thoroughfares and occasionally wrestled protesters to the ground with batons, though there were no serious injuries. "They were released a short while later on the condition that they disperse. Police said about 100 masked 'criminal' anarchists were marching among about 200 protesters who appeared to be law-abiding." In response to this blatant police attempt to criminalise dissent, an anti-Olympics campaigner told the paper: "The Vancouver Organizing Committee are the criminal element that have pilfered the public coffer of as much money as they could, and we're going to see the effects of it after these Games with cuts to education, cuts to housing, cuts to all the public services." Alissa Westergard-Thorpe of the Olympic Resistance Network was quoted by the Canadian Press accusing the police of trying to intimidate Olympic critics and pointing out that the protesters hadn't been 'violent' at all, as had been widely claimed. "Protesters have never been violent toward human beings," she said. "Property damage is not the same as violence, and it certainly is nothing compared to the tools that police have, manhandling them, pushing them, hitting them with bicycles." ANGRY South Africans rioted this week in protest at the conditions in which they are forced to live. Coming at the same time as the ANC establishment's celebrations of the 20th anniversary of Nelson Mandela's release from jail, the uprising exposed the hypocrisy behind the 'new' South Africa. 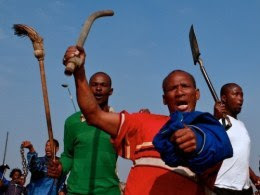 Reported Pumza Fihlani for the BBC: "Burning tyres litter the streets; every road is blockaded with piles of large rocks, thick black smoke fills the air, the sound of rubber bullets is followed by loud screams - this South African township is alive and its anger is spilling over. "Siyathemba, near Balfour, is one of more than 10 townships which took part in a spate of protests last year over a lack of basic services such as clean water, electricity and proper housing. "The African National Congress (ANC) promised to deliver such bare necessities when it came into power in 1994, ending decades of white minority rule. "Many poor South Africans are starting to lose patience with their government. 'A better life for all,' was the party's slogan at the time and yet today some feel this dream has remained just that. The township's name means 'We (have) hope' in the local Swati language and yet residents here say they have nothing to be hopeful for. "Some are carrying petrol bombs and large stones and vow to harm anyone who dares to stop them. 'We are sick and tired of waiting,' yells one woman from a crowd that has gathered around me, as I try to speak to them. 'Mandela has been out of jail for 20 years, 20 years and nothing has changed here'." Media reports suggest that the police have beaten and tortured a number of people while hunting for ‘community leaders' in the area. This may be an early indication of how the ANC plans to deal with grass roots threats to its political hegemony in South Africa. Writes Frans Cronje, deputy CEO of the South African Institute of Race Relations, on the Politicsweb site: "The level of popular protest against the ANC in black communities is a great embarrassment to the party and the Government. "To their great relief this dissatisfaction has not yet translated into a significant loss of electoral support for the party although it eventually must. "It must also have dawned on the ANC that the threat to their political hegemony in South Africa does not come so much from Mrs Zille in Cape Town as from the sense of disillusionment growing in poor and black communities. "The specific risk being that a grass roots protest movement pulls the political rug out from under current leadership of the ANC. If these assumptions are correct then it is difficult to escape the conclusion that what concerns the State in Balfour is not so much the violence and disorder in the community, but rather that the community is establishing a leadership structure outside of the hegemony of the ANC. "Today it is twenty years to the day since Mr Mandela walked out of prison. We are left to reflect whether any of his party's supporters thought that they would again see the day when the police broke down their doors in the middle of the night and with threats of violence demanded to know the whereabouts of the ‘community leaders'." 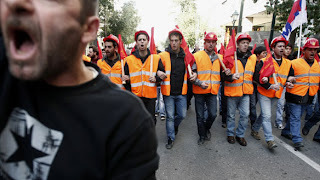 GREEK workers are today protesting against austerity measures being imposed by the government at the behest of the IMF and the global financial system. The BBC reported that public sector workers launched a nationwide strike: "Flights have been grounded, many schools closed, and hospitals are operating an emergency-only service. " On Tuesday, the 'socialist' government announced that it intends to raise the average retirement age in a bid to save the cash-strapped pensions system. Added the report: "The move comes on top of other planned austerity measures, including a public sector salary freeze and a hike in petrol prices announced last week. "Public sector workers will not be hit as hard as they have been in the Irish Republic, but they complain that some of the lowest paid will suffer while the rich dodge tax with impunity, our correspondent says. " THE USA is in serious trouble in Pakistan, with a resistance attack revealing the presence of its special operations forces in the country. In a report entitled "Explosion blows US cover", the Toronto Star writes: "The deaths of three American soldiers in a Taliban suicide attack in northwest Pakistan on Wednesday lifted the veil on United States military assistance to the country that authorities here would like to keep quiet. "The soldiers were among 60 to 100 members of a Special Forces Operation team that trains Pakistan's paramilitary Frontier Corps in counter-insurgency techniques, including intelligence gathering and development assistance. "The Special Forces training, underway for the last 18 months, has been acknowledged gingerly by both the Americans and the Pakistanis but has been deliberately kept low-key so as not to trespass onto Pakistani sensitivities about sovereignty, and not to further inflame high anti-American sentiment. "Even though Pakistan is termed an ally by the United States, Pakistan has not allowed American combat forces to operate here. "To disguise themselves, , the U.S. soldiers were dressed in traditional Pakistani garb of baggy trousers and long tunics, according to a Frontier Corps officer. "Their armoured vehicle was equipped with electronic jammers sufficient to detect remote-controlled devices and mines, the officer said. Vehicles driven by the Frontier Corps were placed in front and back of the Americans as protection, he said. "Still, the bomber was able to penetrate their cordon." Reuters quotes Ahmed Rashid, a Pakistani analyst and expert on militant, as saying of the revelation: "It will only convince the public, even moderate Pakistanis who are anti-Taliban, that the government is doing nothing expect lying to them, and the military (is) for that matter. It will be a big blow for public morale." The report added: "First television channels said the dead foreigners were journalists, then officials said they were aid workers. Only later did the Pakistani military and the U.S. embassy say they were American soldiers." Pakistan's foreign ministry spokesman said the U.S. soldiers were invited by the Pakistani paramilitary Frontier Corps to attend the inauguration of a U.S.-funded girls' school. CAPITALISM'S global enforcers, the IMF, are preparing to turn the screws on southern Europe. And, as usual, it is the working people who will have to pay the price of the bankers' and speculators' failures and excesses. 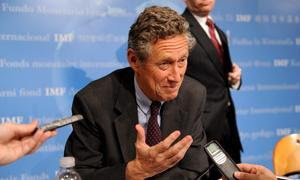 The Spanish media is widely reporting warnings from IMF boss Olivier Blanchard (above) that Spain, Greece and Portugal will probably have to make 'major sacrifices' to restore their 'competitivity' including lower wages, presumably to 'compete' with the slave labour of the Third World. Back in December we reported one expert's view that: "Southern Europe is being ordered to carry out IMF-style austerity, without the IMF-style devaluation required to rectify the massive imbalances that have built up between North and South under the euro." Ambrose Evans-Pritchard, international business editor of the right-wing Daily Telegraph in London, warned that the neo-liberals were scared that a growing anarchist movement in southern Europe would thwart their economic plans. 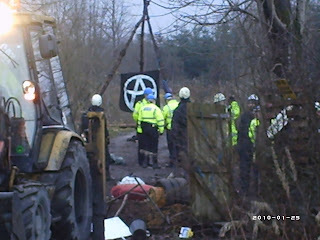 RADICAL environmentalists in Scotland put up a heroic five days of intense resistance to the eviction of the Mainshill Solidarity Camp, protecting woodlands from coal mining. Reported Indymedia Scotland: "A total of 45 people have been arrested, making Mainshill the biggest protest site eviction in 11 years. The eviction is not an end, but merely a beginning - the struggle continues! "All five days saw the violence inflicted by the state on those who try to create positive change, and the collusion between the courts, police and corporations. "But they also saw heroic acts of defiance, with people fighting off bailiffs until having their hands and feet cable-tied together and supporters maintaining a 24-hour vigil throughout the eviction. "This eviction is not an end, but the beginning of a campaign of community-based radical direct action sweeping Scotland’s central belt which can only grow in strength. "From actions to stop work on opencast sites and the shutting down of a major coal rail terminal for a day (which happened for a third time on Wednesday), to community engagement and solidarity resulting in a seven-month occupation and a positive change in direction for radical environmentalism in Scotland. "But where can we go next? We’ve hit these capitalists and money-grabbers where it hurts most – in the pocket – and we can’t wait to hear how much it has cost them in total. "Over 30 direct actions have taken place over the past 12 months, and that’s not including the eviction. Machines have been trashed, health studies published and bonds been made with those affected by heavy industry and the causes of climate change. We’ve dug tunnels, defended trees and climbed onto diggers. "The Mainshill Solidarity Camp has now been evicted, but the struggle continues!"